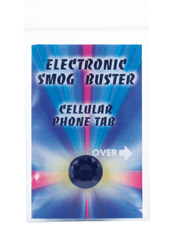 Clears most harmful radiations from phone: Cellular, Cordless or regular. Peel protective cover from adhesive backing and affix to top of phone or behind earpiece. Tab may be attached directly to outside of carrying case. Specifications: Phone Tab is approximately 0.5 inch in diameter and made from a unique space age ceramic.